When I was little, my parents always sang "You are my Sunshine" to me. That's what they called me, their Sunshine. They said it was because I brought so much brightness to their life. I think it was because I seemed to run off the sun, the battery to my Energizer Bunny. If it was sunny, I was sunny. Just like there are beach people and mountain people, I think there are rain people and sun people. I'm rooted fully in the sun camp. I can feel a physiological and psychological response when that Vitamin D comes into contact with my skin. If I was an animal, I'd definitely be that cat who's always napping happily in the sun. It's probably a good thing I live in Santa Barbara, where we get less than 15 inches of rainfall and more than 300 days of sun each year. Because when it does rain, I become a walking zombie. It feels like my hands are in vats of quicksand as I type on my laptop. My eyes feel like they never really open for the day. I find myself drinking an inordinate amount of Coke even though it seems to have no affect. And I'm really not that pleasant to be around. Last Saturday it started to rain. And it's rained and rained and rained ever since. We even had lightening and thunder a few days, which is almost unheard of around here. The poor animals were ill-prepared. But I think we put a pretty good dent in that 15 inches of rain in just the past 5 days. While normally I'd be all sleepy and pouty about it, this time I was actually happy to see the rain. It's ridiculous but I've had this lentil and chorizo soup recipe I've been dying to make. I've been traveling a lot lately, and there is something so comforting and restorative about a pot of soup simmering on the stove as you curl up on the sofa and read a book in front of a fire. And it is Fall, people. Halloween is right around the corner so it seems like a little cool, rainy weather is called for to help get us in the mood. 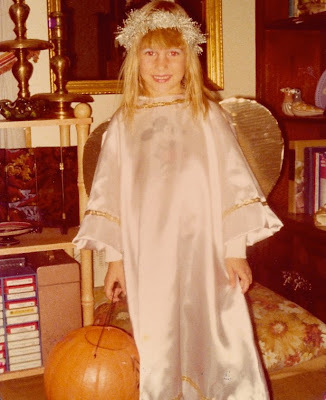 On an aside, I can't think of Halloween without recalling the mishap with the angel costume my mom made me when I was in kindergarden. It was a beautiful white satin gown, and I had a sparkly halo made from silver Christmas tinsel wrapped around a bent coat hanger and cardboard wings covered in aluminum foil. We were living in Ft. Leavenworth, KS at the time, and the weather always took a precarious dip just as Halloween arrived. My mom wouldn't let me go trick-or-treating in my costume unless I wore a sweatsuit underneath. Of course when you're a kid you have no temperature gauge and I told her I'd be fine. Being the good mom she is, she refused. The real issue was not that I had to wear an extra layer for warmth. Oh no. It was that I didn't have a plain white sweatshirt. The closest thing I had was one with Mickey Mouse plastered on the front. When I put my costume on over it, low and behold, you could see Mickey through my ethereal gown! That just would not do! Who's ever seen an angel sporting Mickey Mouse on their ensemble?! I threw a hissy fit and refused to go trick-or-treating. Well, that lasted about 10 minutes once I realized I'd miss out on the one day a year where you're encouraged to go up to strangers and ask for candy, even if it meant looking like a moron angel. So back to the soup I happily made in the rain . . . . This recipe called for lentils, butternut squash, fennel and tomatoes, which sounded delicious and quite healthy. But I was looking for some good comfort, so the addition of chorizo was more than welcomed. I love chorizo with its overtones of sweet and smokey paprika awakening my taste-buds. I enjoy just eating it solo slice after slice, but it's also amazing to cook with, adding incredible depth and that certain "what exactly is that I'm tasting that's blowing my mind?" 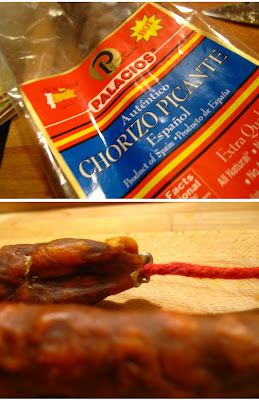 Uh, it's chorizo. If bacon is to the South, chorizo is to Spain. It's got just as many uses and, just like bacon, everything tastes better with it. This recipe calls for fresh tomatoes, blanched, seeded and then diced. If you still happen to have a few lovely lingering tomatoes at the market as we do, follow this easy trick. Cut an "X" in the bottom of each tomato and plop into boiling water for 1 to 3 minutes. The cut allows the boiling water to loosen the skin so it peels off in a snap. The same technique works for peaches. But if it's past season, you could certainly use canned whole tomatoes and then seed and dice them. I also just wanted to say that sometimes garnishes seem totally unnecessary and I shrug them off. But I must implore you to go the extra step and add the paprika dusted creme fraiche. The creaminess finishes the soup off and adds a lustrous layer to it that your tongue will love you for. 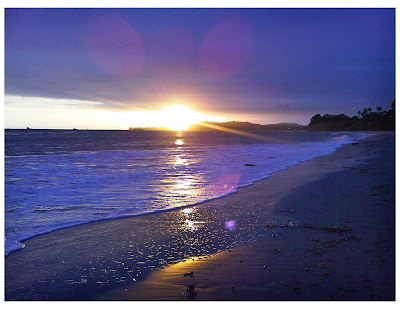 The rain did pause, at least momentarily, around sunset today, and I took a walk along the beach. For some reason I haven't spent much time there this year. But boy did it feel good to inhale that salt-water air and feel the soft sand beneath my feet. 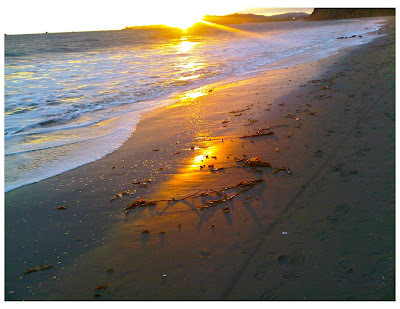 And also made me kick myself for not taking more walks on the beach at sunset. It is glorious. With the dampness still clinging in the air and the temperatures dropping as I walked back to my car, I looked forward to going home and heating up another bowl of this comforting soup. But as I head to bed tonight I'll be praying for sunshine. In a large pot, heat two Tbsp olive oil over medium heat. When warm, add the onion, leek, celery, chorizo and thyme and sweat for 4 minutes, stirring but not browning. Add the garlic and continue to cook for 1 minute. Add the tomato paste and tomatoes and cook, stirring, for two minutes. Add lentils, carrot, butternut squash, parsley, bay leaves, water and stock. Bring to a simmer and season with salt and pepper. Cover and simmer for 20-30 minutes or until the vegetables are soft. Salt and pepper to taste. I like my soups more pureed than brothy so I took maybe 4-6 cups of the broth and veggies out (trying to avoid the chorizo) and blended it in a blender to puree. Add a Tbsp creme fraiche with a dash of paprika (or mix together before adding) on top of each serving of soup. Serve immediately. Yields: 6-8 people.